Thread: Question - What is / are Second (2nd) Generation Mustangs? ANSWER: Lee Iacocca, who had been one of the forces behind the original Mustang, became President of Ford Motor Company in 1970 and ordered a smaller, more fuel-efficient Mustang for 1974. Initially it was to be based on the Ford Maverick, but ultimately was based on the Ford Pinto subcompact. 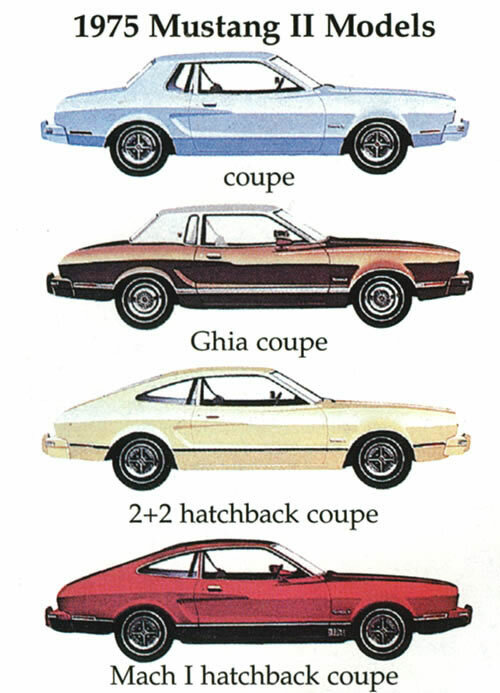 The new model, called the "Mustang II", was introduced two months before the first 1973 oil crisis, and its reduced size allowed it to compete against imported sports coupés such as the Japanese Toyota Celica and the European Ford Capri (then Ford-built in Germany and Britain, sold in U.S. by Mercury as a captive import car). First-year sales were 385,993 cars, compared with the original Mustang's twelve-month sales record of 418,812. Lee Iacocca wanted the new car, which returned the Mustang to its 1964 predecessor in size, shape, and overall styling, to be finished to a high standard, saying it should be "a little jewel." However not only was it smaller than the original car, but it was also heavier, owing to the addition of equipment needed to meet new U.S. emission and safety regulations. Performance was reduced, and despite the car's new handling and engineering features the galloping mustang emblem "became a less muscular steed that seemed to be cantering." The car was available in coupé and hatchback versions, including a "luxury" Ghia model designed by Ford's rececently acquired Ghia of Italy. Changes introduced in 1975 included reinstatement of the 302 CID V8 option (after being without a V8 option for the 1974 model year) and availability of an economy option called the "MPG Stallion". Other changes in appearance and performance came with a "Cobra II" version in 1976 & 1977 and a "King Cobra" in 1978. For almost a decade, consumers had come to know the Ford Mustang as a power performance machine, with performance increases delivered on an almost yearly basis. In 1974, Ford took a different approach. Instead of increasing the engine size, they downsized it. A completely redesigned Mustang II was launched, available in either a 2.3L inline four cylinder engine or a 2.8L V-6. Neither engine was extremely powerful, outputting 88 hp and 105 hp respectively. To the dismay of many Mustang enthusiasts, the V-8 engine was no longer an option, and the convertible model was a thing of the past. In addition to a smaller engine, the car itself was more compact. In comparison to the 1973 model, the Mustang II was 19 inches shorter and 490 pounds lighter. Bottom line, this Mustang was, in all respects, a completely different car. Oddly enough, consumers loved the new design and the Mustang II was a big hit. Ford sold close to 385,993 units within the first year. The company hadn’t seen such lucrative sales since the introduction of the Mustang in April of ‘64. Consumers spoke and Ford listened. In 1975, the V-8 engine once again returned to the Mustang lineup. In spite of its return, this new 302-cubic inch 4.94L engine was nothing like engines of the past. In fact, the ’75 V-8 was only capable of producing around 130 hp, and was only available with an automatic transmission. Ford coined the new engine the 5.0, thus making this vehicle the first official metric designated Mustang. The 5.0 name would stay with the Mustang through the 1980s and 1990s, representing performance power in a new generation of Mustang vehicles. Inspired by the Shelby Mustang, Ford introduced the Mustang Cobra II in 1976. In the spirit of racing, the Cobra II featured a non-functional hood scoop, distinctive front and rear spoilers, as well as racing stripes in white and blue or black and gold. The car very much resembled the look and feel of the original Shelby Mustang, although it lacked the power of the original. The special edition King Cobra Mustang made its debut in 1978. It was the first Ford Mustang to officially feature the 5.0 badge. In all, an estimated 5,000 units were produced. The King Cobra had a distinctive exterior style, featuring a prominent air dam and a cobra decal on the hood. Other than this release, the Mustang lineup remained mostly unchanged.